A Glebe resident of 40 years, Aunty Kathy Dodd Farrawell has been combining craft with community for some time now. 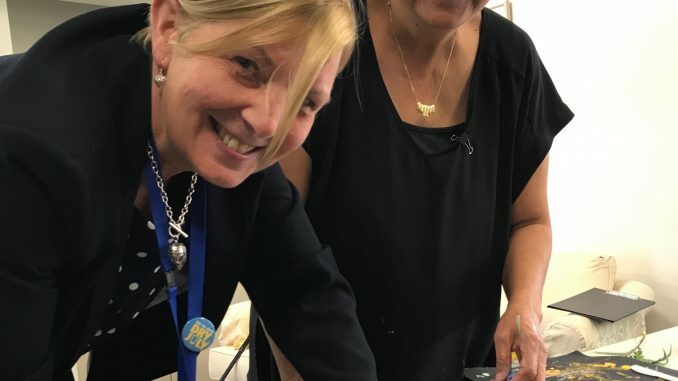 Aunty Kathy and her niece Lucretia are Gangari artists (which means “grinding stone” in Birri language), and they’ll be guiding the community artwork at ‘Uplifting’, the Sydney Inner West Rotary fundraiser at Canterbury Hurlstone RSL on October 22. All proceeds go to to the Sydney Survivorship Centre at Concord Cancer Centre, and everyone can join in on the artwork to spread messages of goodwill. They’re amazing people, all different ages from all different directions. The main point is for them to put down what they want in colour, and we’ve been working on profiles of their faces. There’s a certain way of doing it, by getting the side of the face and putting it on the artwork. We have the boomerang to represent flight and return to good health. There’s also the tick to represent good health. It’s a lot about connecting with families from different directions, on the land of the Gadigal people of the Eora Nation. At the fundraiser, we will be creating a new piece where community members can sign messages of goodwill. How did you become passionate about art? Through coming from a large family. My grandmother is from the Kaanju people up in Cape York, and my father is a Birri man from out where Adani’s trying to destroy our mother’s earth. His name is Goggine, which means ‘black cockatoo’. He was born in 1907 and we have a big family. I’m the last of 11 — I have eight brothers and two sisters. There were a lot of people around me who did a lot of creative work. It came from seeing that, and music, which is a big part of healing too. When you’re little, you’re allowed to play in the mud and in the creek, so you have those early experiences. When you come to be an adult, you blink your eye and you’re getting to be older, and you see where all these things come into play. It’s an appreciation of life that was given to me from my mother and my father. It’s about the big family and surviving, and Aboriginal people have done that always and we’re still here. It’s like a medicine, it’s very therapeutic. It’s uplifting and I love it. It’s not just about me as a person, it’s about us all working together and you’re learning all the time from older and younger people. What does working with young children teach you? They teach you different things because children are unstructured in the sense that we’ve all been structured. You can give someone confidence in what they’re doing, and let them put things down within a framework. There’s a lot of masking tape and stencils, and it all comes together. I think you learn acceptance when you work with kids, so if someone’s having a bad day, you can tell them to settle down, but always welcome them back. They teach you how to be that child that you grew out of. What’s the most rewarding aspect of living and working in the Inner West? The people! I love Glebe, and there’s always different people from all different directions. When the children grew up here in Glebe, they grew up with people from all different language areas of the world. Of my ten grandchildren, some are Chinese, some are Irish. I love the beauty of our children and grandchildren having friends from all different places when they grew up here. What’s your meal of choice after a long day of painting? I like kangaroo, we cook that once or twice a week. Put the kangaroo in a frying pan with the water, and add the salt, pepper and curry powder. Stir on medium heat and until cooked. Peel and slice the sweet potato, then cook it up just like mash potato with some butter. Stir the mash into the pan to thicken up the kangaroo curry. You can serve with boiled vegetables (carrots, cabbage, peas and beans) or with damper or bread. Add your own sauce or curry powder to match your taste!